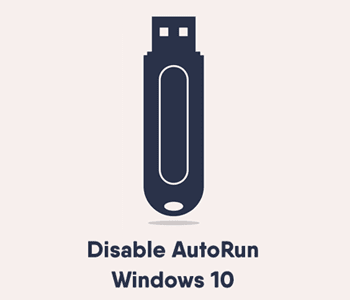 AutoRun feature in Windows 10 is designed to improve the user experience by auto launches the file called autorun.inf whenever the external devices like USB, CD, DVD, Memory Card, SD Card are plugged into your computer. This auto run file, autorun.inf will then enable your computer to perform various types of operations like auto launch the setup or installer, auto play the media contents, etc. Unfortunately, the AutoRun feature had been used by a malicious group of people to spread virus. The autorun.inf file can be used to install virus from the external devices to your computer the second you plug in the infected devices. Although AutoRun feature can be useful, disabling it might be the best way to protect your computer from the AutoRun virus. The AutoRun feature in Windows 10 is enabled by default and in the following tutorial, we’ll show you two different ways to disable the Autorun in Windows 10. Click on the Search icon located at the bottom left of your screen and search for Settings. From the search result, click on the Settings that appear under the Best Match. This will open the Windows Settings. You can also use the command key Windows + I. Under the Windows Settings, click on the Devices button. Then click on the AutoPlay link on the left navigation panel. Toggle the AutoPlay option to disable it. By simply deleting autorun.inf file in your external devices, Windows 10 will no longer be able to execute any AutoRun operations. This will stop the infected external devices from installing malicious virus to your computer. Launch the Windows Explorer and browse to your external drive location. Do note that the Autorun.inf file is hidden by default. In order to view this file, click on the View menu and then check the option Hidden items. You should now be able to see this file. Select autorun.inf file in this folder, right-click the mouse and select Delete.